"...the beginning of an impressive singing career...the competition has just arrived." "A superb singer...one of the most beautiful vocal instruments in the business today...the most accomplished and promising jazz-swing vocalists in the country." "Marinaro takes his place among the top five male jazz singers active today." "A solid voice, a cool attitude, and swinging swagger...a shining example of male jazz vocal at the top of its game." Capturing the excitement of a live performance. Places the listener in a seat at the nightclub. Paul is happy to announce the arrival of two new releases! His debut album, the critically acclaimed concept album Without a Song, is being reissued as a Limited Edition 180 gram Double LP Vinyl release. His highly anticipated follow-up album, One Night in Chicago, was recorded LIVE in June 2015 and will be released on CD in late fall 2015. Both are now available for pre-order! Right there under your nose in Chicago is a singer named Paul Marinaro who is the best I've heard in many years. His insight and command over this material is truly staggering, making him one of that select cadre of storytellers. Like Nat Cole, it's art so close to perfection that it seems almost artless. I've heard many new singers and no one has touched me as deeply as this guy. He's got it all. 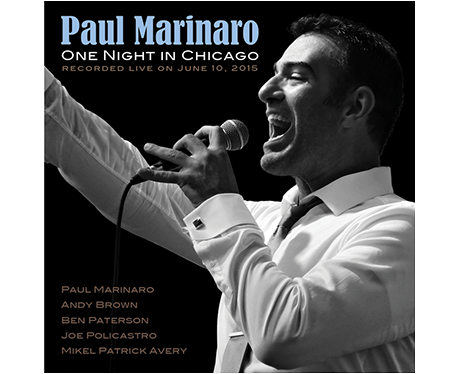 Chicago-based jazz vocalist Paul Marinaro, dubbed as having "one of the most plush baritones in Chicago – or just about anywhere else" by Howard Reich of the Chicago Tribune, is a modern classic. © Copyright Paul Marinaro. All rights reserved. Created by Thomas Cray using Bootstrap and Solid!